STUART McLAREN struck early while Andrew Oldcorn left it late as the Capital duo took the first step towards playing in next month’s Open at St Andrews. Host club amateur McLaren, 20, claimed one of just spots up for grabs in the regional qualifier at Bruntsfield Links with a two-under-69 in the day’s opening group. And, at the other end of the field, Kings Acre touring pro Oldcorn came in with a 67 as the 55-year-old also progressed to next week’s final qualifier at Glasgow Gailes. The last man to finish, former PGA champion Oldcorn left a dozen players disappointed as those on 70 missed out on the chance of a play-off. McLaren was quickly into his stride with an eagle-3 at the third, where he hit a 5-iron to ten feet. “That was a real confidence boost,” he admitted afterwards. Back-to-back birdies also helped in that department and he was four-under with five to play before the “fun and games started”. That was reference to a double-bogey at the 15th, but he was delighted to par in after that, especially making 4 at the 17th after short-siding himself in a greenside bunker. “This is the third time I’ve played in this here and I’d never shot better than 76 before,” declared a delighted McLaren. It was a success, however, that left him having to change his arrangements for a forthcoming holiday. “I’ve got flights booked to Spain on Saturday,” he revealed. Oldcorn, the winner two years ago at the same venue, missed a short par putt at the last to repeat the feat. Instead, that honour went on this occasion to Kilmacolm amateur Matt Clark after he signed for a five-under-par 66. “All I wanted to do again was win, so I’m disappointed to have missed that putt at the last,” admitted Oldcorn. “It was the only poor putt I hit all day as well. But it was a case of job done again and for a 55-year-old to do that against all these young boys isn’t bad. “This is definitely my last appearance in this event. Oldcorn’s effort was matched by rising Scottish amateur star Connor Syme (Drumoig) while Glencruitten left-hander Robert MacIntyre and Norwegian Vetle Maroy claimed their spots with 68s. The last of the seven places went to Fifer Scott Stewart-Cation as he finished alongside McLaren. Keith MacKenzie, the son of former Bruntsfield Links pro Brian, recovered from starting with two bogeys to card a 70 only to miss out by one shot after an agonising wait. 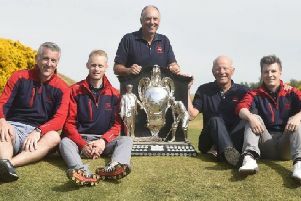 Others to miss out on 70 included Royal Burgess star James Ross, Royal Musselburgh’s Ryan Buckley, Keir McNicoll (Gullane) and Murrayfield amateur Ali Thurlow. “I didn’t putt well at all today,” said Ross, who will now turn his attention to teeing up in the SSE Scotttish Hydro Challenge starting at Macdonald Spey Valley in Aviemore on Thursday.